Baltimore Harbor is crossed by three different highway crossings that have a total of 16 lanes. I-695 Francis Scott Key Bridge, photo taken from west shoreline. The 3.5 mile north approach to the Francis Scott Key Bridge was a two lane elevated freeway, and it was widened and reconstructed to four lanes divided, and mostly at ground level. With completion of the project in January 2000, the entire eastern portion of the I-695 Baltimore Beltway is now built to four-lane urban Interstate standards. With the I-695 Sparrows Point widening completed, Baltimore Harbor is now served by sixteen lanes on three separate cross-harbor freeways. Twelve lanes cross the inner harbor, and four lanes cross the outer harbor. Completed widening and reconstruction of I-695 on Sparrows Point, photo taken July 2000. Heading westbound approaching Bear Creek Bridge. Baltimore Harbor was a major urban transportation barrier, but major traffic jams were sharply reduced when the Fort McHenry Tunnel opened. The present project will help keep the freeways flowing well, even during rush hours. The Harbor Tunnel Thruway was an acute bottleneck from about 1970 to 1985. The Key Bridge provided some traffic relief, but it was the completion of I-95 through the city that really unplugged the cross-harbor traffic problem. This is a good example of urban freeway development keeping pace with the increasing traffic. There were some that opposed the I-95 construction, saying that I-95 would quickly become congested. Not so, the Fort McHenry Tunnel carries over 111,000 vehicles per day, and provides an adequate level of traffic service at all times, as the freeway has eight lanes. The four-lane Key Bridge carries over 30,300 vehicles per day, and the four-lane Harbor Tunnel Thruway carries over 63,000 vehicles per day. These volumes are both well within the traffic engineering designs of each facility. They are 2001 counts, cited from the MDOT MDTA website. Before the Key Bridge and the Fort McHenry Tunnel opened, the Harbor Tunnel Thruway traffic reached almost 90,000 vehicles per day, and it was congested. There are two freeways that cross the inner harbor, the eight-lane I-95 and the four-lane Harbor Tunnel Thruway. With twelve lanes across the inner harbor, and four lanes across the outer harbor, a level of traffic service is provided that is adequate to this day. Since the north approach to the Key Bridge was widened to four lanes in 2000, the eastern portion of the beltway will be able to handle 60,000 vehicles per day or more. Baltimore Harbor has three cross-harbor freeways with a total of 16 lanes. They are administered by the Maryland Department of Transportation, Maryland Transportation Authority (MDOT MDTA). Maryland Transportation Authority links to Fort McHenry Tunnel, Baltimore Harbor Tunnel, and Francis Scott Key Bridge. At each of these crossings, the toll for a two-axle vehicle is $2.00; each additional axle is $2.00. 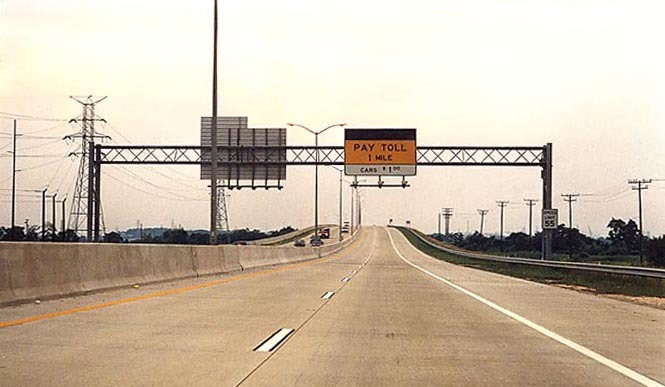 In April 1999, the Authority unveiled its M-TAG electronic-toll-collection system, a state-of-the-art method for collecting tolls that benefits motorists and the environment, for commuters who use the Baltimore-area crossings. The M-TAG system allows commuters the ease of paying their tolls electronically. MdTA Ft. McHenry Tunnel Fact Sheet. MdTA Baltimore Harbor Tunnel Fact Sheet. MdTA Francis Scott Key Bridge Fact Sheet. About the Maryland Transportation Authority: "Since 1971, the Maryland Transportation Authority has been responsible for managing, operating and improving the State's toll facilities, as well as for financing new revenue-producing transportation projects. The Authority's seven facilities - a turnpike, two tunnels and four bridges - help keep both private and commercial traffic moving in Maryland. All of our projects and services are funded through tolls paid by customers who use our facilities". When the Baltimore Harbor Tunnel (I-895) opened to traffic on November 29, 1957, it was an event of national importance. The new tunnel was widely heralded as breaking the "Baltimore Bottleneck" for the first time ever. For years, traffic had crawled through the narrow streets of Baltimore as the only direct route between Philadelphia and the South. The traffic situation peaked in the mid 1940s, when a federal official called Baltimore "the worst city in the United States, as far as I know, on the matter of taking care of its through traffic". 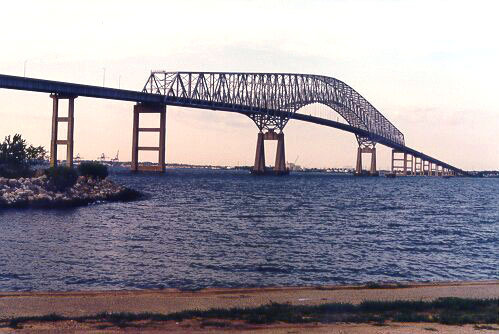 The need to break this bottleneck was apparent, and Maryland's State Roads Commission -- the predecessor of the MdTA -- began to make plans under "Maryland's Primary Bridge Program". The program, which had been developed and approved in 1937, called for crossings of the Potomac, Susquehanna, and Patapsco Rivers and the Chesapeake Bay. After a debate as to the planned crossing's location, the State Roads Commission finally decided on a Canton-Fairfield crossing as the best solution to address the City's and State's local- and through-traffic needs. Officials selected a tunnel, rather than a bridge, to carry the traffic after experts were convinced that the costs of a twin-tube tunnel could be supported by the toll revenues it would generate. Construction began in January of 1955. At the time, the tunnel was considered an engineering marvel. Each of the tunnel's 21 twin-tube sections is 300 feet long (the size of a football field) and was built in ship-yards and launched like a ship. Tugs then towed the sections to the construction site. The tunnel was built using the open-trench method -- which means that the prefabricated sections were sunk in a trench dredged in the harbor's bottom, and the sections joined together under water. An integral part of the tunnel is its ventilating system -- the means for removing the exhaust fumes of thousands of vehicles and constantly replenishing the tunnel with fresh air. The ventilation system includes one ventilating shaft and building over each end of the tunnel. Fresh air is supplied through a duct under the tunnel roadway and distributed through air flues. These flues are located just above the roadway on each side of the tunnel.  Air in the tunnel tube is drawn off into duct above the tunnel ceiling and then dispersed into the atmosphere. Gigantic fans that supply the fresh air, and remove the stale air, are located in the two ventilation buildings. Carbon monoxide levels in each tube are monitored around the clock. The tunnel was an instant success. It eliminated 51 traffic signals for through traffic in downtown Baltimore, provided a cross-harbor route for local commuters, and diverted up to 40 percent of commercial vehicle traffic from local streets. Interstate 895: 17 miles of four-lane divided highway, including 64 bridge structures; dual two-lane tunnels 1.5-miles long and 101 feet below the water surface. Two tunnels beneath Baltimore Harbor are important routes for local traffic and a substantial portion of vehicles passing through the area on I-95, the East Coast's busiest and important highway for personal and commercial travel. The first of these, the Baltimore Harbor Tunnel, is designated I-895 and was opened in 1957. It connects north-south highways and arterials in Baltimore's industrial section. The four-lane, 1.4-mile tunnel carries about 22 million vehicles a year. The Fort McHenry Tunnel, the world's widest underwater vehicular tunnel, carries I-95 under the harbor near historic Fort McHenry and close to downtown Baltimore. It was opened in 1985 and is part of a network of harbor crossings providing service to local and interstate traffic. The 1.5-mile, eight-lane tunnel handles nearly 40 million vehicles a year. Traffic feeds to and from both tunnels from I-95 north and south of the harbor. I-895 - Harbor Tunnel Thruway, by MDRoads.com. All photos taken by Scott Kozel. Copyright � 1997-2006 by Scott Kozel. All rights reserved. Reproduction, reuse, or distribution without permission is prohibited.